Wells-next-the-Sea RNLI Lifeboat Station houses an all-weather lifeboat and an inshore lifeboat to save lives and assist with emergencies around Wells and off the North Norfolk coast. Manned by volunteer crews, the boats are ready to launch within minutes, 24 hours a day, every day of the year. This website will tell you more about the station and give you a taste of what we do and the traditions of the lifeboat service. Wells Lifeboat was tasked to a Mayday for a 33' ex-fishing vessel Effie which had run aground in the approaches to Blakeney harbour on a rising tide and required assistance. The all-weather lifeboat launched outside the boathouse at 17:42 and proceeded toward the casualty which had re-floated on the incoming tide and was now heading out of Blakeney harbour. The angling charter boat Whitby Crest was on scene and stood by the Effie until the lifeboat arrived at 17:58. A lifeboat crew member was transferred to the casualty vessel which shortly developed mechanical problems with a badly overheating engine. To avoid further damage, the engine was switched off and a tow passed from the lifeboat and passage resumed back towards Wells harbour. At 18:36 the lifeboat and casualty entered Wells harbour and proceeded to the quay. With the casualty safely moored on the pontoons at 19:10, the lifeboat left the scene and returned to the boathouse. The boat was recovered but because of the high spring tide, she could not be re-housed until 22:00. UK Coastguard requested the inshore lifeboat to launch to a windsurfer in trouble on Wells beach. The ILB arrived on-scene at 12:15 by which time the windsurfer had managed to make it to shore. The crew confirmed that all was well and returned to station. About to launch on exercise, the inshore lifeboat was tasked by UK Coastguard to search for a missing person at Wells quay. Police and coastguard officers were already searching the area. The ILB started searching at 09:14 and at 09:25 shore crew left the boathouse to assist with the shoreline search. Sadly, at 10:01, the person was located in the water at the pontoons. The casualty was subsequently landed by the ILB at the east end slipway. Wells inshore lifeboat launched with four crew on-board to assist emergency services attending a yacht moored out the east end in Wells. 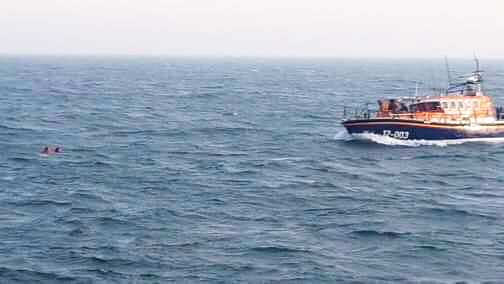 UK Coastguard requested the immediate launch of the all-weather lifeboat to a Mayday for fishing vessel Lainey, sinking with two crew on-board approximately 6 miles north-north-west of Wells. The ALB launched at 14.30 and proceeded to the casualty position. A Belgian military helicopter, already in the area, was first on scene and dropped a liferaft into the water and then held position above the casualties to assist location. Windfarm vessel Seacat Magic arrived at 14.57 and stood by until the Wells Lifeboat arrived two minutes later. The Lainey having sunk, the two casualties, wearing lifejackets and holding on to life-rings, had been in the water for over 20 minutes. They were quickly recovered onto the lifeboat and given first aid. Rescue Helicopter 912 from Humberside arrived on scene and, at 15.06, winched the two casualties up from the lifeboat for transfer to Norwich and Norfolk hospital. Both men were later able to return home. The lifeboat returned to station at 15.50 and was re-housed, re-fuelled and ready for service at 18.00. Wells Lifeboat marks its 150th year as an RNLI lifeboat station this year. The Royal National Lifeboat Institution took over the provision and management of a lifeboat in Wells in 1869, building a boathouse on the quay (which is now the harbour office) and providing the 'Eliza Adams', a 32ft rowing and sailing lifeboat. Records show the town had a lifeboat, provided by the local Norfolk Shipwreck Association, as far back as 1830. The 150th anniversary will be marked with the presentation of a vellum to the station on Saturday 13th July 2019, with an invited audience at the boathouse. In the afternoon, the public will be invited to join in and it is hoped to have both our current all-weather and inshore lifeboats along with historic and modern lifeboats on display in the outer harbour and in a flotilla up to the quay. An exhibition about the RNLI and the history of Wells lifeboat station will be on view in the town and plans are being discussed for other related events to mark the occasion. More details will be posted when available. RNLI Wells flag pin badges in stock! We're delighted to announce that we've managed to obtain some brand new RNLI Wells flag lapel badges. These are genuine metal RNLI Lifeboats flag pin-badges with the legend Wells next the-Sea which, as anyone who has asked recently will know, are rarely available. The badges are available at the boathouse (when open) for a minimum donation of £3. Alternatively, please send a self-addressed envelope ready-stamped with 79p postage (2nd class large letter) and a cheque for £3 (or a larger donation) payable to "Wells RNLI" to Pin Badges, RNLI Wells Lifeboat Station, Beach Road, Wells-next-the-Sea, NR23 1DR and we'd be pleased to pop one in the post to you. We're delighted to announce that we've managed to obtain some brand new RNLI Wells flag lapel badges. These are genuine metal RNLI Lifeboats flag pin-badges with the legend Wells-next-the-Sea. The badges are available at the boathouse (when open) for a minimum donation of £3. Alternatively, please send a self-addressed envelope ready-stamped with 79p postage and a cheque for £3 payable to "Wells RNLI" to Pin Badges, RNLI Wells Lifeboat Station, Beach Road, Wells-next-the-Sea, NR23 1DR and we'll pop one in the post to you. Planning permission has been granted for a new lifeboat station at Wells to house our forthcoming Shannon-class all weather lifeboat but legal work relating to the new site has taken longer than expected and we are now hoping that building work will be able to start in September 2019. This will take around 18 months to complete so our new Shannon-class lifeboat should then come into service late in 2021.